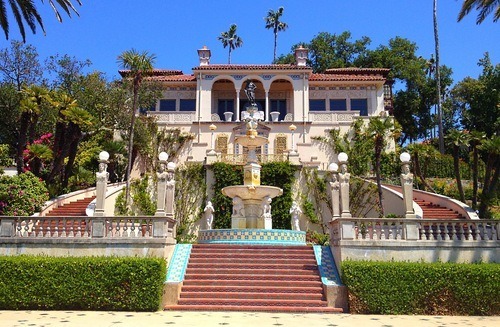 William Randolph Hearst was a wealthy businessman who inherited a family fortune as a young man and expanded it into a vast newspaper and magazine publishing empire during his adult life. 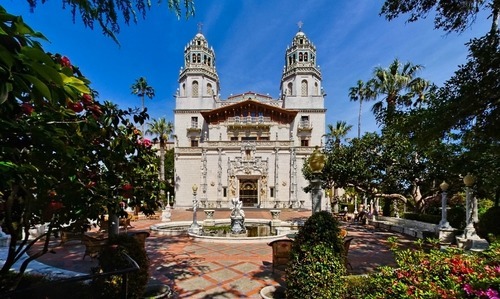 In 1919, he inherited his family’s 250,000 acre retreat property in San Simeon on the Central California Coast and aspired to build a vast Spanish Revival style mansion on it. 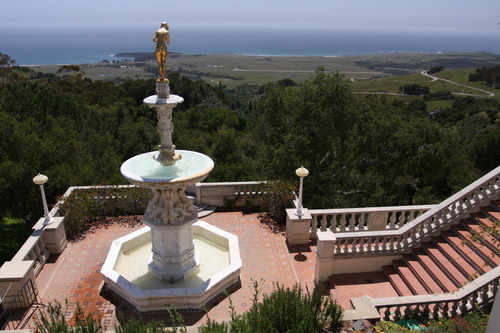 There was already a large Victorian home on another part of the property, but Hearst chose to develop the “Enchanted Hill” that sits at an elevation of 1600 feet and provides vast sweeping views of the coastline below. We visited the property this summer while traveling down the California Coast and were swept away by its beauty, elegance, and grace. 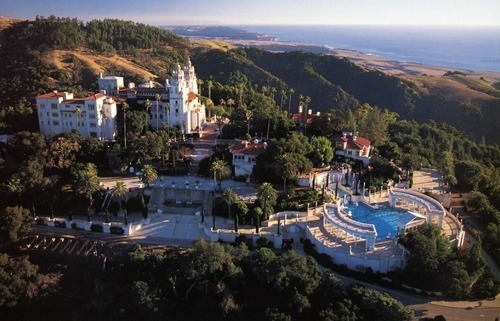 The name “Hearst Castle” is a bit of a misnomer. While the main house, aptly named Casa Grande (pictured above), is every bit of a Mediterranean castle, there’s so much more that comprises the rambling California estate, including: several other cottages, gardens, verandas, pools and even a private zoo. 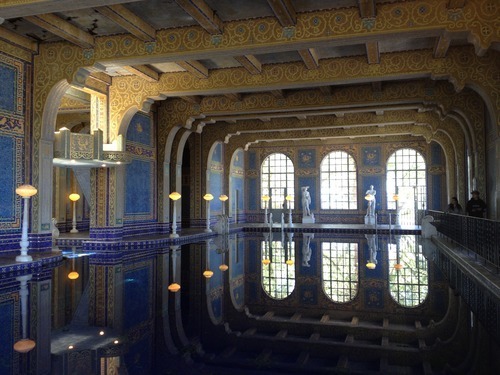 Hearst commissioned renowned architect Julia Morgan to design the estate in 1919, but he was intimately involved in the process with constant tinkering and change orders. Construction actually continued until 1947 when Hearst permanently moved away from the property after becoming ill; so technically the property was never finished to completion. The compound is as expansive as it is magnificent. Casa Grande (above on left) is the largest building on the site with approximately 60,645 square feet of living space including 56 bedrooms, 61 bathrooms and 19 sitting rooms. 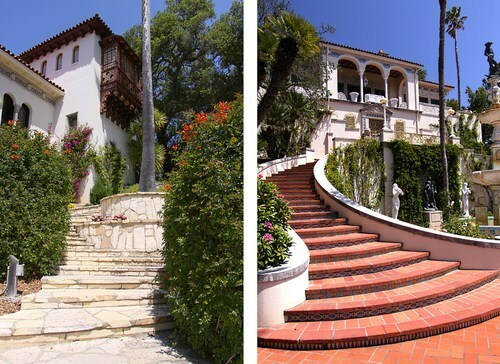 Three guest cottages: Casa Del Sol, Casa Del Monte, and Casa Del Mar (pictured above and below), surround the main house and were used by Hearst’s VIP guests – including a who’s-who of Hollywood movie stars and international dignitaries of the era – when they stayed at the property. 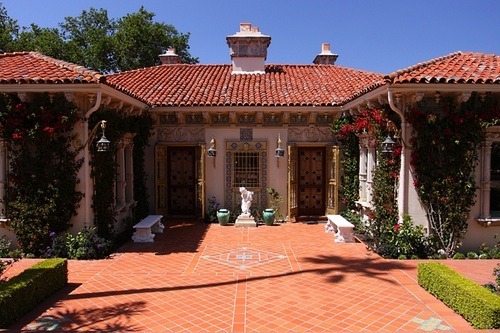 Although each cottage is unique, like the main house, the cottages were all of the Spanish Revival style. 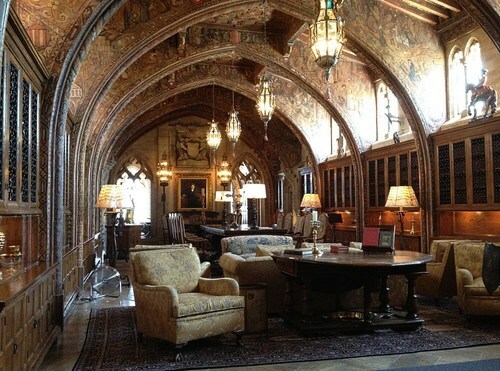 Hearst was a collector of countless European antiques and used them to furnish the property – inside and out. The gardens surrounding the cottages are park-like and impeccably landscaped. Hearst demanded that there be flowering plants year-round, so that the grounds would remain fresh and different to his guests depending on when they visited. The undulating terrain of the hilltop property lends itself well to grand staircases and breathtaking vistas, complete with fountains and centuries-old statues from Hearst’s private collection. There are no undesirable views on the property – whether you’re looking westward over the Pacific Ocean (above) or eastward into the Santa Lucia mountains (below left) – at every turn the scenery is stunning. 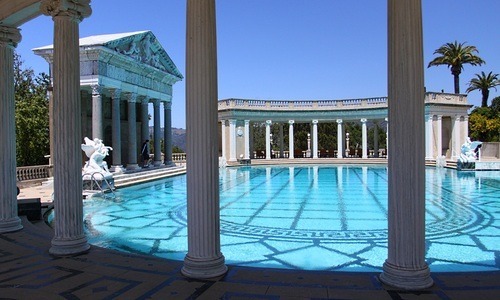 One of the most dramatic and picturesque spots on the estate is without question The Neptune Pool (below). The present pool, which is actually the third incarnation of a pool on the site, was completed in 1936. Hearst was not satisfied with the first two designs and had them rebuilt to his liking. Cascading waterfalls lead down to a 104 foot long oval-shaped pool surrounded by a ring of marble columns; an authentic ancient Roman temple façade (shipped in pieces from Italy and re-assembled onsite) is situated at the opposite side and looks back up toward the cottages. The covered colonnade at either end of the pool provides shade for guests and exquisitely frames the serene setting. Verandas and vistas surround the pool with changing areas hidden away from site. 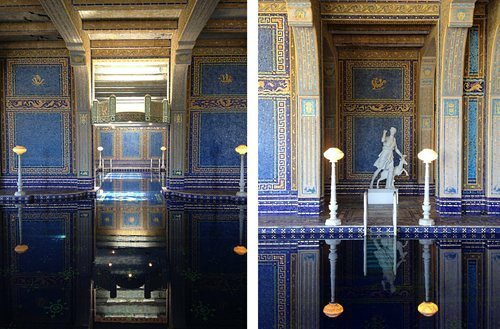 As if the Neptune Pool wasn’t enough, the fantastic indoor Roman Pool (below) is breathtaking. The design was influenced by The Baths of Caracalla from the 2nd Century near Rome. Every surface of the walls, ceilings, and floors is covered in 1 inch square glass tile with mosaic patterns inspired by 5th Century Mausoleum of Galla Placidia in Ravenna, Italy. There are also eight marble statues carved for Hearst by Italian sculptor Carlo Freter in the 1930’s. The nice thing about the tours that are offered (and there are several) is that you’re free to wander around the property grounds at your leisure before and after your interior tour. 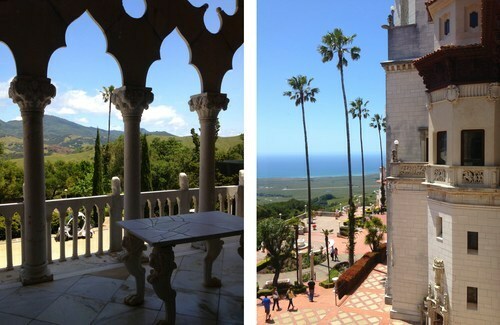 You could easily spend the whole day just taking in the exterior property, but no trip to Hearst Castle is complete without taking at least one of the tours of the interior. 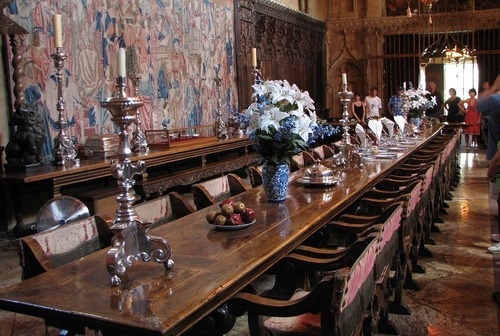 The Dining Room in the main house is where Hearst would serve grand meals to his many guests. You can’t tell from the picture above, but the room’s ceiling is over 30 feet high with large flags that hang on either side. 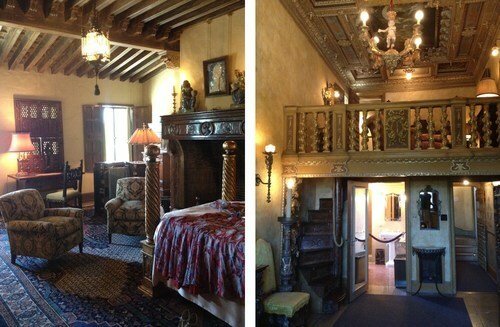 We chose the Upstairs Suites tour, which took us through Hearst’s own private quarters, known as The Gothic Suite, which included his own massive library/study (above) and his-and-her bedrooms (below) with a large sitting room situated in between. A second more public library (below) is also located in the upper floors of Casa Grande where guests were welcome and encouraged to read from the 4000+ books that can be found there. 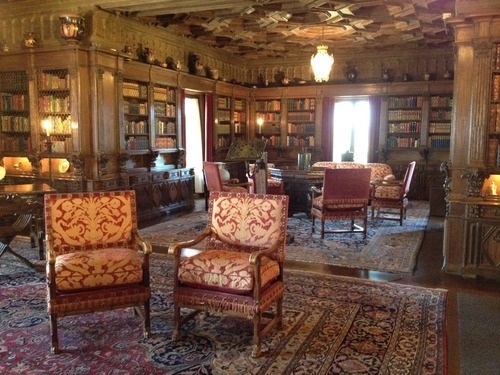 This room also houses Hearst’s prized collection of 150 ancient Greek vases, all of which are over 2000 years old. The vases can be seen in the image below lining the upper shelf that runs around the perimeter of the entire room. 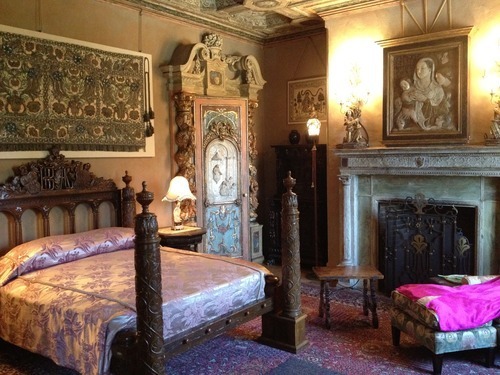 As I mentioned earlier, the main house has 56 bedrooms, each of which is furnished with authentic antiques that Hearst himself collected on his many trips abroad. 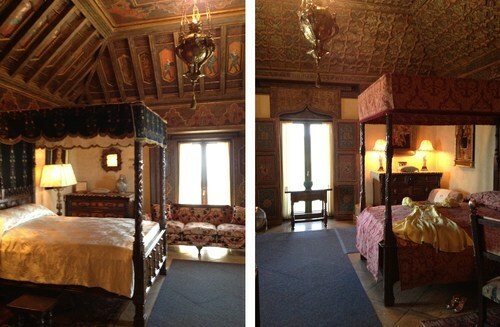 In some cases, entire rooms were re-created including fireplaces, beds, artwork, and elaborate ceilings that were shipped back from Europe piecemeal and re-assembled in the Castle. 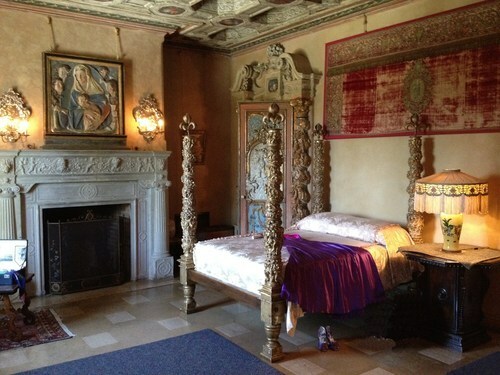 Hearst furnished most of the estate with late-medieval art and antiques and his Hearst Castle collection remains intact on the property, in its entirety, as it was when he lived there. However, many pieces from his other extensive private collections are on loan to museums around the world. When Hearst left the property for the last time in 1947, he lived with his companion Marion Davies at her Beverly Hills estate until his death in 1951. In 1957, the Hearst Corporation donated the estate to the State of California and it’s been operated by the State as a museum ever since. One of the conditions of the donation was that the Hearst family still have access to the property for personal use at their discretion. In 1972, the property was added to the National Register of Historic Places and it became a United States National Historic Landmark in 1976. 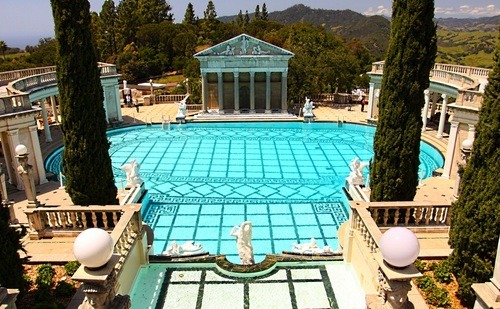 Located on the historic Pacific Coast Highway approximately halfway between San Francisco and Los Angeles, Hearst Castle is open year-round for tours and private events. Over a million people visit the property every year and it can get crowded (especially during the summer months), so if you’re going, it’s wise to make your reservations online beforehand…have fun!! Have you been there? What were your impressions of the property? 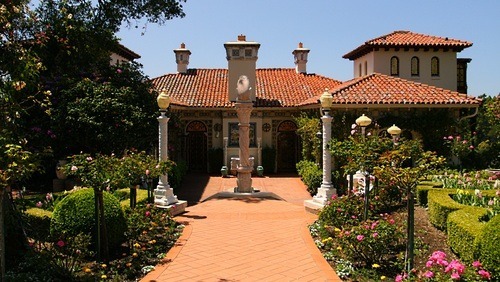 Previous postA Trip to Pasadena For Inspiration from the Masters: Greene & Greene Next postFrank Lloyd Wright Designed Another House For Darwin Martin in Buffalo: The Lakefront Estate "Graycliff"